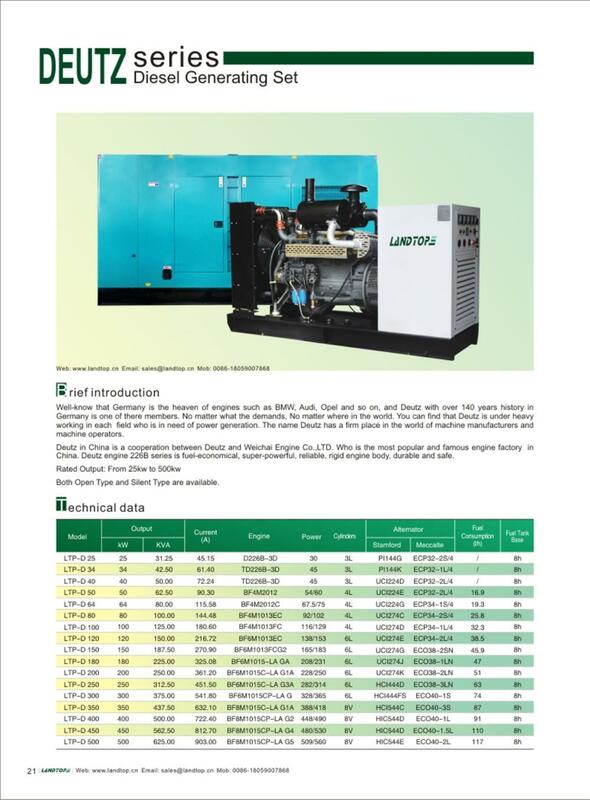 Product categories of Deutz Engine Diesel Generator, we are specialized manufacturers from China, Deutz Engine Diesel Generator, Deutz Diesel Generator suppliers/factory, wholesale high-quality products of Deutz Diesel Power R & D and manufacturing, we have the perfect after-sales service and technical support. Look forward to your cooperation! Stamford, Leory Somer, Engga, Marathon, Siemens, ST/STC etc. The goods are under warranty against defects in material and workmanship for a period of 12 months or 1000 hours ,whichever come first from the date of delivery to the end user except the damageable spare parts of genset caused by incorrect man-made operation, and that the aforementioned warranty for the same taken is back up by the engine and alternator suppliers.